Andy Peaks paid tribute to the volunteers at AFC Rushden & Diamonds after his team got the Hayden Road era off to a winning start. 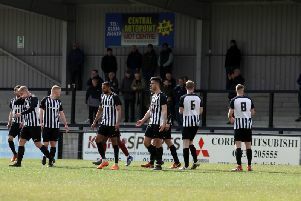 The club only received confirmation that they could start their Evo-Stik South League East campaign in Rushden on Wednesday after a sterling effort to bring the ground up to the appropriate standard over the summer. And those efforts were rewarded on the pitch as Peaks’ players got the new season off to a solid start as Nabil Shariff’s brace secured a 2-0 victory over Hanwell Town. It was a sweet moment for Peaks who played at Hayden Road for Rushden Town before the merger with Irthlingborough Diamonds back in 1992. And he was relieved to see his players stick to the script. “I have made no secret about the fact that I was delighted to know I was going to manage the club here,” Peaks said. “The volunteers have done a fantastic job and I said to the boys before the game that we needed to win for the people who have put so much time and effort in for the club. “They were about five months ahead of schedule and it proves there is a lot of togetherness at the club. “You always have ups and downs at every club but what they have done over the past few weeks shows we have some amazing people behind the scenes. As far as his team’s performance was concerned, Peaks was satisfied with what he saw, although he felt they had “another gear” that they didn’t use as they remained fairly comfortable after Shariff followed up a first-half penalty with another goal early in the second period. Hanwell did hit the woodwork three times during the game but the Diamonds boss added: “Every day it’s about winning but particularly on the first day of the season, it’s nice to get on the board. “It was never going to be easy, they were never going to lie down and I thought they looked quite good at times especially going forward. “I am pleased with how it went. I was happy with 1-0 at half-time but we knew they had a set-piece in them and some good attacking players so we wanted to get that second goal. “We got it and then we seemed to go through the motions and it was a bit flat. I felt we had another gear if we needed it . Diamonds will now begin their preparations for their first away game of the season at Thame United on Tuesday night.